Our son works in the construction industry. Several years ago he was fired — unfairly — from his job and thus denied access to Employment Insurance benefits that he had been contributing to for several years. Not only was he out of work, but, since he couldn’t obtain benefits, he couldn’t take another apprenticeship course to upgrade and diversify his skills. So he appealed the denial of his claim to the EI Boards of Referees. He had to write up his appeal case and appear in person before the three-member panel consisting of a representative from labour, the employer, and government. They treated him respectfully and drew out his story. He answered honestly, they listened, and then unanimously agreed that the denial of his benefits had been unfair. He received his benefits and so was able to upgrade his apprenticeship and enhance his skills. The overt fairness and smooth operation of the process gave him faith in the system. That’s gold in these days of youth alienation and ennui. It worked for a lot of other workers, too. Of the approximately 53,000 appeals the boards of referees receive each year, about half are dealt with by the El Commission prior to the hearing stage. Of the appeals that appear before the board, most are decided, unanimously, in favour of the claimant. The EI Boards of Referees are one of the great success stories of Canadian labour relations. They are independent, part-time tribunals, consisting of more than 900 active members hearing appeals in 83 centres across Canada (plus 32 umpires who hear appeals from Boards of Referees decisions). Labour and employer groups each suggest referees, who are then appointed by the worker and employer commissioners on the Employment Insurance Commission. Chairs are appointed by the government of the day. But that’s all gone now. Buried on page 196 of Bill C-38, Stephen Harper’s 425-page budget implementation document (ironically dubbed “The Jobs, Growth and Long-term Prosperity Act”), was a provision to eliminate the boards. They are to be replaced by 74 members of a new Social Security Tribunal, to be appointed by the Harper government. No more labour or employer appointees. The Tribunal will also hear appeals from Canada Pension Plan and Old Age Security claimants. Only 37 of the tribunal members will hear El appeals, and how can they do the work of 900 locally-based experts, even if they were part-time? It’s just not possible, with so few people, to maintain the system that’s been in place for decades. Something’s got to give and it will be the right of workers denied El benefits to a speedy, fair, and non-legalistic determination of their appeals. Surely more appeals will be dismissed now for narrow, technical reasons, and justice will be denied to many. What would our son’s fate have been under this new system? For obvious reasons, Harper wanted to bury this move and the media complied. Only one paper in Canada, the Saint John Telegraph-Journal, reported the story fairly and adequately, and how many Canadians read that paper? The Globe and Mail, National Post and Toronto Star— with the exception of one letter—contained nary a word on the elimination of the boards of referees. Papers owned by Postmedia, from one end of the country to the other, did mention the move about a month after the bill was introduced and debated. But it was mentioned only once — in the 12th paragraph of a story about defeated Conservative candidates receiving patronage appoint­ments since the 2011 election. Ten of the appointments were to the boards of referees. The implication was clear: since these appointments are pure patronage, who cares if the boards are axed? It’s almost as if the story came directly from the Prime Minister’s Office. Eliminating the referees is just the latest attack on workers’ rights and benefits. Employer and employee El contributions had built up a surplus of $57 billion by 2010. With a stroke of the legislative pen the Harper government reduced the surplus to $2 billion and siphoned the rest into general revenues to pay for the recession. “It’s the biggest theft in Canadian history,” NDP leader Jack Layton fumed at the time. The result was rampant cynicism. Both employers and employees lost confidence in the integrity of a system that could be completely changed without their approval. No wonder, as Carolyn Rice notes, “employers stepped up pressure on government to reduce business’s payroll costs.” Why should they, or workers for that matter, make contributions to a fund that could end up somewhere else? In contrast to its secretive approach to changes to the El appeals process, the government’s handling of changes to El benefits seemed choreographed to create near mass hysteria. And the media took the bait. The government released details bit by bit, fuelling speculation early on that unemployed workers would have to relocate or take any job as long as it was above the minimum wage. Bill C-38 removes the power of the EIC to define what constitutes “suitable employment” and the “reasonable efforts” a jobless worker must make to find this job, or risk losing benefits, and gives it to cabinet. It did not define these terms, causing a fury of speculation as to what might be required. After the bill received second reading and was sent to the House Finance Committee, Finance Minister Jim Flaherty said that definitions of acceptable search and suitable jobs would be broader than in the past. “There is no bad job,” he told reporters. “The only bad job is not having a job.” Why even he had to drive a cab and referee hockey games, for goodness sake. Cabinet ministers—probably coordinated from the PMO—lined up to tell their stories about the low-paid jobs they had done in the past: Labour Minister Lisa Raitt had to work in a Dairy Queen, Treasury Board President Tony Clement was an usher in a movie theatre, Immigration Minister Jason Kenney worked as a janitor, and even Stephen Harper worked in the Imperial Oil mail room before moving onward and upward. The comments sparked anxiety among Canadian workers that they would have to abandon their trades and careers and take any available job at any wage. In the end, the changes were not nearly as severe as the ministers had hinted. Perhaps unemployed Canadians heaved a collective sigh of relief in response: they’re bad but not as bad as they could have been, workers may have thought. But the changes were still significant. Workers will be expected to take jobs that pay 10 to 30 percent less, depending on how frequently they received El benefits in the past. And they will also be expected to take jobs that require a commute of one hour or more in areas like Toronto and Vancouver. Government will provide no new money for skills training for unemployed workers or for job search counselling. And while the Prime Minister’s Office was fanning the flames of fear about what “suitable work” and “reasonable effort” might entail, the government slipped another blow to some workers into a ten-word paragraph well-hidden in Bill C-38,repealing the Fair Wages and Hours of Labour Act, which required contractors bidding on federal contracts to pay “fair” wages and overtime. The move was applauded by non-union contractors and Postmedia columnist Andrew Coyne, who commented, spuriously, that the “market,” not govern­ment, should set wages. Of course, the implication is clear. Wages for govern­ment contracts will be driven down. There’s a common thread to these Harper government actions: eliminate organized labour from playing any meaningful role in public policy and the economy. Not only were worker organizations removed from their role of suggesting worker referees. For forty years the Canadian Labour Congress nominated the Commissioner for Workers for the EIC. 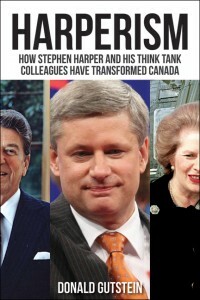 This time, the Harper government ignored the CLC recommendation and appointed someone else. We reflect with our son about what it was like “back in the day”—the 1960s and ’70s—when we believed that democratization of the workplace was possible and that all sectors of Canadian society should have a say in how things are run. And then we experienced thirty years of tripartism, and then, in the last decade, ever-greater worker exclusion. Now the centre is so far to the right we don’t have much space in which to operate. Harper is changing the face and culture of what it means to be a Canadian. He has a plan and he’s sticking to it. Not only do we need to do whatever we can, electorally, to interrupt his plan, but we need our own plan for a progressive future, for the sake of our sons and daughters and for succeeding generations. Mae Burrows is a long-time environmentalist and social justice activist and her partner, Donald Gutstein, is an adjunct professor in the School of Communication at Simon Fraser University. Their column “Jobs, Environment, Justice” appears in every issue of Our Times. Feedback always welcome.